Tommy Porter at the helm of his Susan & Kimberly. 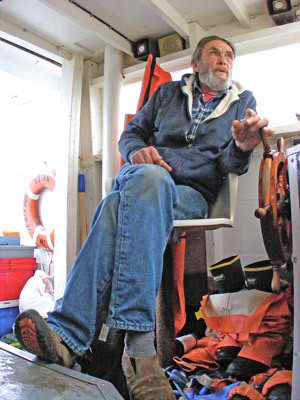 MARBLEHEAD, MA – Tommy Porter is 66 years old according to the calendar, but he’s lived a life that goes way beyond that. He left home for the first time when he was 14: his mother sent him to the store for a can of tuna fish; he returned a few weeks later (having been to California and back) and handed her a can of tuna fish. Tommy grew up around the water, but he was also handy with a wrench and a hammer (which proved to be life-saving as well as a way to make a living). 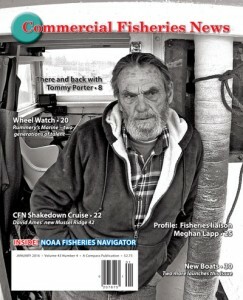 He was one of the early pioneers of offshore lobstering out of Massachusetts, fishing with his older brother Manny; his longtime friendship with Bob Brown led to tours of duty on the Sea Star and Hannah Boden – and he got off the ill-fated Andrea Gale just two months before it was lost at sea. From the deck to the wheelhouse, Tommy Porter has seen a lot of green water and a lot of life (as well as his share of death). These days he fishes out of Gloucester, splitting his weeks up between “the old homestead” in Marblehead and a home that he and his wife bought up in Maine. Tommy says he doesn’t mind the drive back and forth each week, which is no surprise: this man has already spent more than a lifetime’s worth of wheel watches; what’s another couple hundred miles? What you are about to read are some glimpses into the life Tommy Porter has lived, told in his own words. There’s nothing fancy here – and be forewarned that sometimes the going gets rough – but it’s as real as real gets, sitting aboard Tommy’s 38’ Susan & Kimberly with the recorder going.